Another round of matches start today – subject to rain, and it’s been pelting down here last few days – and it should be quite interesting. Andrew Strauss needs a score/hundred in his game against Warwicks. Failed twice in his first game of the season last week – just needs to get moving right about now. Surrey’s disasterous (here and here) start to the season also needs a kick: they’re in Cardiff playing Glamorgan, although don’t count on there being much play today. 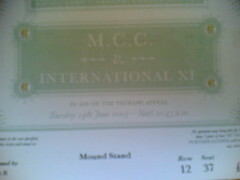 And in the same game, Jimmy Anderson will be another I’ll be watching/reading carefully. He’s started the season very well, by all accounts, despite some unattractive figures. Huge season this for him. What a great idea [via Ubersportingpundit] – definately one for the cricket anoraks, and anyone who wishes to pay for my airfare out there is very welcome. I wish England would have something like this. As a kid, I always wanted to know how bats and balls are made. Jeez, how tragic am I? Shane Warne will go down in cricket history as the greatest spinner the world will ever see. But, surely, his greatest feat has been in the enlivening of the game: he is a brilliant, absorbing entertainer who most cricket fans would pay to watch even standing at 2nd slip, or batting…let alone twirling his arm over. There’s no one like him. With entertainment comes controversy: he’s been involved in several off-the-field problems with dodgy text messages, and dodgy women, and dodgy drugs and dodgy other things. However, today’s latest “Warne Shocka” involves him on the field, by a very bitter and upset Chris Adams. Adams claims Warne, with great intent, tried to “humiliate” a number of Sussex’s players in the recent (and exciting) county game. This is not good news, of course – if Adams is correct. But I can’t help feeling it’s one failed English batsmen’s cheap shot at one of the greatest players in history. Off the field he was outstanding and the first person to congratulate us and say what a great game it was, but I have lost a lot of respect for him because of the way he behaved in this match. In his enthralling book, which I read a few months back, Shane mentions a Pura Cup match which had the rarity of having a number of then-playing Australian Test cricketers. (not got the book at hand – perhaps someone can fill in details if they know the players concerned). These Test cricketers had obviously become great mates over a number of years – and yet, the match itself was played harder and with greater intensity than a Test match. I think that sums up today’s storm in a tea-cup, unless Warne did indeed cross the “decency boundary” and went too far (but we’ll never know). Adams, 32, played a handful of games for England in the late 1990s. Warne, 35, has a world record 583 Test wickets and will aim to add to that tally when the Ashes series starts at the end of July. Precisely: Adams, grow up and grow some testicles. I’m sure Matt Prior, who is a potential ‘keeper for England this summer, will in retrospect be thankful of Warne’s “outburst”: he knows what to expect if he makes it to the Test arena! County cricket is still weak, and harbours weak individuals. Crack on, Warney. In what will be the closest I’ll get to an Ashes Test-atmosphere this year, my 3 tickets for the Tsunami fund-raiser arrived today. Can’t wait. We’re in the “smoking section” of the Mound stand (since when did the ground have designated smoking areas? And have they erected a wall to divide us smelly smokers from anti-smokers?!). More on the match here – I really hope it’ll be packed out…I’m taking two of my mates, neither of who have been to an International before, or to Lord’s. London County Cricket Club – Pop Idol final? Fascinating chase on by Hampshire, v Sussex, at Hove right now. They, Hants, need another 85 to win – and Kevin Pietersen is in, and has 33 at a run a ball having just hit his 2nd six. He’ll want to win this game for Hampshire, having made a duck in his debut innings a few days ago. Update: he went beserk hitting 61 from 51. Video highlights available here.